Those who have lost all of their teeth — or are soon to have their last, failing teeth removed — have several options for tooth replacement. One of the most advanced and reliable techniques is to permanently attach lifelike prosthetic (new replacement) teeth to dental implants that are anchored in the jawbone. Implant-supported teeth look and function just like real teeth, and are maintained with the same oral hygiene practices, such as brushing and flossing. They provide important health benefits (described is this article). And while dental implants are relatively expensive, a newer procedure that also provides functional teeth on the same day implant surgery is performed has brought the cost down and put this beneficial technology within the reach of many. Implant-supported teeth allow normal function of the whole stomatognathic system (“stomato” – mouth; “gnathic” – jaws) including the nerves, muscles and jaw joints. By permanently replacing missing teeth — and lost gum tissues — implant-supported teeth restore the support of the facial structures (cheeks and lips), thereby creating a more youthful appearance as well as the ability to function normally. This includes chewing tough foods, eating fresh fruits and vegetables, laughing, kissing, speaking confidently, and smiling with joy. 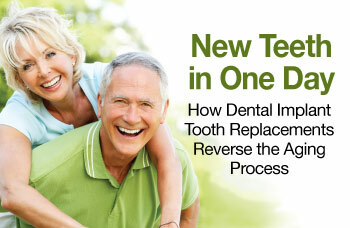 It is not an overstatement to say that permanent tooth replacement with implants has revolutionized dentistry. Implants have particularly transformed the lives of people who are edentulous (completely toothless) by giving them a solution that is a lot more comfortable, secure, and reliable than removable dentures. They also prevent the loss of jawbone density and volume that is inevitable when teeth are lost. 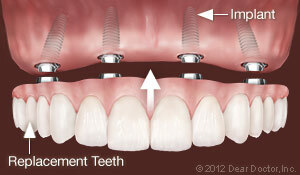 Dental implants stabilize and stimulate the bone around them, maintaining bone dimension and strength. This is something removable dentures can't do. In fact, wearing dentures actually accelerates bone loss. A dental implant is a small, screw-shaped post that replaces the root of a missing tooth — the part that is housed in the bone beneath the gum. Implants are made of titanium, which has a unique ability to fuse to bone in a process called osseo-integration (“osseo” – bone; “integration” – to join with or fuse to). That's what makes them so sturdy and reliable. After implants are inserted into the jawbone during a well-tolerated surgical procedure, fixed bridges can be attached to them immediately that look and function like real teeth. This can be accomplished in one or both jaws in the same day. Today's state-of-the-art implant systems enable a minimum number of implants to support a maximum number of teeth. That means as few as four implants can be used to support a full arch (upper or lower jaw) of fixed, non-removable replacement teeth. And this remarkable life-changing event can be accomplished in a single day! This person had no upper teeth, and wore an old denture that fit poorly. 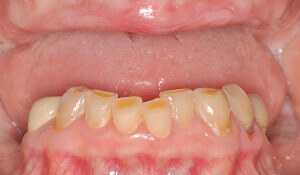 An implant-supported fixed denture replaced the upper teeth, re-establishing the smile as well as the ability to eat. When the implants are placed in the jawbone, they must remain completely immobile to allow the process of osseo-integration to occur. Any force that causes even minute movement of the implants in the early healing phase can ruin the integration process, resulting in implant failure. That's why a soft diet (no hard, crunchy or tough foods) during the first 6-8 weeks is essential. The implants themselves must be strategically placed to offer the most effective support. 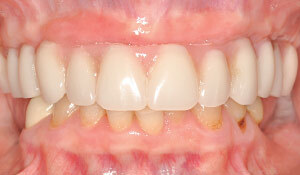 By rigidly connecting the new teeth to the implants, they stabilize each other. Think of this arrangement like a tabletop or chair supported by four legs — which are sometimes angled outward for maximum support. This process is not only the most efficient way to replace all the teeth, but also the most cost-effective strategy for implant-supported tooth replacement. Individual implants to replace each tooth are impractical and not recommended. Given that there are usually 28 functional teeth (excluding wisdom teeth), replacing teeth individually can be vastly more expensive and may not offer any better results.